John O’Neill was born in Drumgallon, Co. Monaghan, on the 9th of March 1834 to John and Mary O’Neill. His father died of scarlet fever, six weeks before young John was born. His mother, unable to eke out a living in Ireland and fearful for her children’s survival, emigrated to the United States in the latter part of 1835 with two of her children and settled in Elizabeth, New Jersey. John stayed behind with his grandfather, In December of 1848, at age 14, John left Ireland to join his mother and siblings in the United States where he completed his formal education. His first job was with a Catholic publishing company as a sales representative and a number of years on the road he settled in Richmond Virginia, where in 1855 he opened a bookstore. He joined the local branch of the Emmet Monument Association the aim of which was to provide military training to young men who would use their training to rid Ireland of English rule. 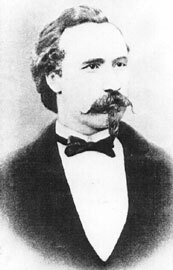 In 1857 he sold the bookstore and enlisted in the Second United States Dragoons but disillusioned with the lack of action, O’Neill went AWOL and headed west to San Francisco where he spent the next few years. While living there O’Neill met his future wife Mary Ann Crowe, an Australian of Irish parents. In 1859, having second thoughts about his desertion from the Dragons he turned himself in and, fortunately for him, was returned to duty without trial. At the onset of the Civil War in 1861, he was stationed in San Francisco with the 1st United States Cavalry, formerly the Second United States Dragoons. He returned to the east coast with his regiment who had volunteered for action in the Union Army. In March through July of 1862 the regiment was engaged in the battles of the Peninsular Campaign launched by the Union army in an attempt to circumvent the Confederate Army in northern Virginia and capture Richmond the Confederate Capital. On June 27, at the battle of Caines Mill, O’Neill was promoted from sergeant to the rank of second lieutenant for gallantry He volunteered for service in the Union Army and served as an officer in numerous regiments during the Civil War. The Irish were a major immigrant group contributing to the settlement of Nebraska. Speaking the English language, they blended into the population and were found in many communities. However, due to ancient animosities with Britain, some of them colonized in America. Foremost colony in this state is O’Neill, proclaimed the Irish Capital of Nebraska by the Governor in 1969. On June 1, 1866, O’Neill led a Fenian invasion of Canada with the goal of using occupied territory as a bargaining point for Irish freedom. The invasions would ultimately fail to achieve their stated goals and O’Neill was arrested by United States Marshalls upon returning to the United States. John O’Neill, the boy from Drumgallon, led the establishment of Irish “colonies” within the United States. The first Irish colony in Nebraska was set up in Holt County in the town that bears his name today – O’Neill City, Nebraska. 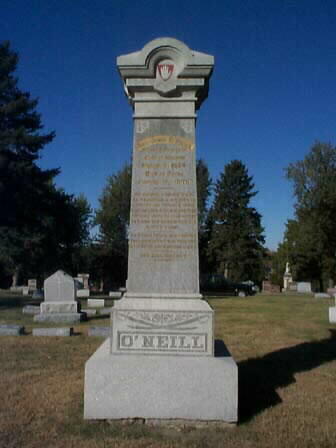 O’Neill died on January 8, 1878, and was buried in Omaha, Nebraska. By nature a brave man. O’Neill City is now being twinned with Blessington where his descendent , Wicklow County Councillor, Gerard O ‘Neill now lives.